The son of one of the most revered leaders of the Palestinian Islamist group Hamas has renounced his religion to move to America and become an evangelical Christian. Mosab Hassan Yousef, 30, said that his decision to abandon his Muslim faith and denounce his father's organisation had exposed his family to persecution in his home town of Ramallah and endangered his own life. But despite the cost, Mr Yousef told The Daily Telegraph that he is convinced that speaking out about the problems of Islam and the "evil" he witnessed back home would help to address the "messed-up situation" in the Middle East and one day bring about peace and enable him to return. "I'm not afraid of them, especially as I know that I'm doing the right thing, and I don't see them as my enemies," he said. "I do think about this a lot. But what are they going to do? Are they going to kill me? "If they want to kill me, let them do it. I'm not going to stop anyone. It's going to be my freedom. "My soul's going to be free of my body, not flesh any more." 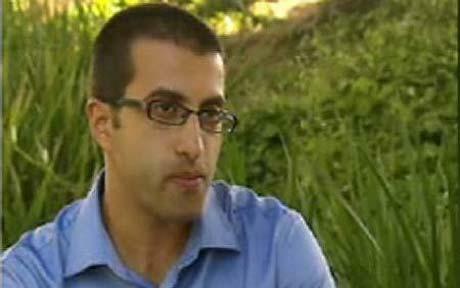 Mr Yousef, who is known as Joseph by friends at the Barabbas Road church in San Diego, California, arrived in America 18 months ago but only recently made "the biggest decision of my life" to go public with his conversion to draw attention to how the Palestinian leadership is "misleading" and exploiting its people. "Palestinians look really ugly in front of everybody in the world and they are very, very good people ... they are misled, and their picture is very dark because of this leadership. "They need some help, they need people to stop lying to them, and lying to the world." Mr Yousef was raised as a Muslim by his politically powerful family. His father, Hassan Yousef, a highly respected sheikh born in the West Bank town of al-Ghaniya near Ramallah, is a founding member of Hamas, whose military wing has instigated dozens of suicide bombings and other attacks against Israel since it was formed in 1987. Hamas now governs the Gaza strip after ousting the more moderate Palestinian Authority led by Mahmoud Abbas, whose administration now only controls the West Bank. Mr Yousef said that the decision to leave the home he loves and his family including five brothers and two sisters had made life hard for them. "They are definitely suffering because of what I've done," he said. "They are not a regular family, they are a very famous family, and Muslims around the world praise my family, praise my father. So when I came with a step like this, it was impossible to think about, it was crazy. "I knew from the beginning my family would face an impossible situation. It wasn't their choice but they have had to carry it with me. It's difficult for my mother, she's crying all day long. Every time I talk to her, she's crying." His mother, Salsabin, told The Daily Telegraph that she and her children were "in daily contact with Mosab" but she declined to comment further on his new life. Mr Yousef said that his father, who has spent more than a decade in Israeli jails for his involvement with Hamas, was in prison when he "got the worst news in his life" - that his son had become a Christian and left Ramallah. "But at the same time he sent me a message of love. "Everybody is asking him to disown me. You understand if he disowns me he will give terrorists a chance to kill me. "He loves me as a son and he believes that what I've done was something I believed in, but at the same time it's very difficult for him to understand and he won't be able to understand." Many saw him as heir apparent to his father, who retains great influence both within Hamas and in Palestinian society, winning election to the Palestinian Legislative Council in January 2006 from his prison cell. But Mr Yousef said that his questioning of Islam and Hamas began early. His father, a pragmatist who has even suggested Hamas would be willing to talk to Israel under certain conditions, would often accept his concerns, such as the targeting of civilians. Mr Yousef said that his doubts about Islam and Hamas crystallised when he realised not all Hamas leaders were like his father, a moderate who he describes as "open-minded, very humble and honest". Mr Yousef said that he was appalled by the brutality of the movement, including the suicide bombers seeking glory through jihad. "Hamas, they are using civilians' lives, they are using children, they are using the suffering of people every day to achieve their goals. And this is what I hate," he said. It was after a chance encounter nine years ago with a British missionary that Mr Yousef began exploring Christianity. He found it "exciting", he said, and began secretly studying the Bible, struck by the central tenet "love your enemies". Nevertheless he does not advocate the "collapse of Islam", but rather for people to acknowledge that after 1,400 years "it's not working any more". He said: "It's not taking them anywhere. It's making them look ugly." He hopes that Muslims will begin to question their religion and "fix it" by rejecting the parts that call for "killing others, cutting hands, cutting legs, torturing people and asking for destruction of entire civilisations". He said that after he converted to Christianity, he decided he had to escape and "live my life away from violence because I couldn't coexist with that situation as a Christian." "I was thinking, what is my responsibility now? To see people dying every day or to stand up and say, this is wrong, this is right and be strong about this? So I had to make this move." He plans to write a memoir about his "transformation" that he hopes will inspire others and to found an international organisation to educate young people about Islam and preach a message of "forgiveness", the only way he thinks "the endless circle of violence" between Israelis and Palestinians can be broken. "I know this take a longer time, but this is the right way to do it, to build a new generation, a new generation who understand how to forgive, how to love." It is a vision his new church shares. In a posting on the Barabbas Road website entitled "Joseph's story", the most unlikely member of the congregation is described as "a miracle" who left a society steeped in "brutal and bloody warfare" and instead "turned to Jesus". "He is most certainly the face of things to come; an Ambassador to those oppressed by Islam. He is passionate about liberating his brothers and sisters from the darkness of a false religion, and living the truth that Jesus is the Way, the Truth, and the Light." Back in the West Bank, however, many are distressed about his move. "It is upsetting not only to his community and to his family but to all Muslims," said Abdel-Jaber Fuqaha, an Islamist parliamentarian and friend of the family who described Mr Yousef as "a straightforward, observant Muslim". "But the worst impact is on his family, and his father. This is a thing that is more unique to our Middle Eastern culture. It is the most difficult thing, to convert from one religion to another." He suggested that Mr Yousef may have been pressured into conversion in exchange for financial help or permission to stay in the US, given his background - allegations Mr Yousef rejects. "I didn't come to Christianity for money, I came to Christianity because this is the way we can live a better life," he said. "I love my people. They have the right to live like any other nation on Earth. But at the same time, I want to help them [get] on the right track."